and handouts from 2006 to 2016. That's 11 Summits! Click here or on the image above to see the entire Table of Contents in eBook format. 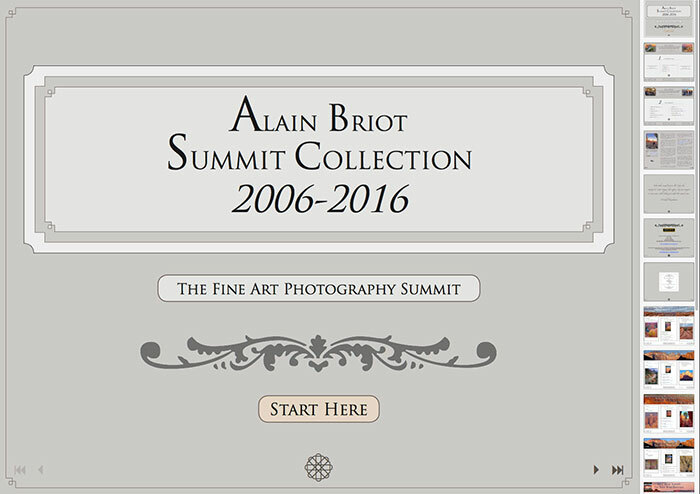 The Fine Art Photography Summit Collection features the complete recordings of all the presentations Alain gave at the yearly Fine Art Photography Summits from 2006 to 2016. 11 Summits total and over 45 presentations! The Collection also features all the seminar handouts, texts, location maps, presentations files and all the other documents that were given to Summit participants. These are provided to you in eBook/PDF format. The Fine Art Photography Summit is a yearly event organized by Natalie and Alain Briot. The event was started in 2003 and it is now in its 15th year. The Summit is held in a different location and features a different guest speaker each year. The Summit is a combination of classroom presentations and field photography. We photograph at sunrise and sunset and during the day Alain and the guest speaker give several seminar-style presentations. In the evening participants have the opportunity to work one-on-one with Alain and the guest speaker. During the Summit we print a selection of photographs taken by Summit participants. A projected group review of these photographs place on the last day of the Summit. We also raffle gift items among which the printer we used during the summit as well as extra paper and other goodies. If you want to learn more about the Summit click here to read my essay about the 2017 Zion Summit. This is the entire audio recording of Alain's Summit presentations from 2006 to 2016: Eleven (11) different summits! It is like being there except you don't have to attend, you don't need to travel, you can listen as often as you want, as many times as you like and you can take your time going through all the materials. 2 - You get over 60 different eBooks for a total of over 200 pages covering each presentation Alain gave at the Summit from 2006 to 2016. These materials are carefully organized year by year with a different table of content for each Summit (Click here to see the table of contents). This makes it very easy to access the material and study at your own pace. The recordings are all in mp3 format which means you can listen to them anywhere and on any device: cell phone, ipod, laptop, computer, music system, in your car, at home, etc. 3 - You get 4 different slide shows, one for each year from 2013 to 2016, featuring photographs taken by Summit participants during the Summits. The slide shows are accompanied with Native American flute music by Travis Terry. 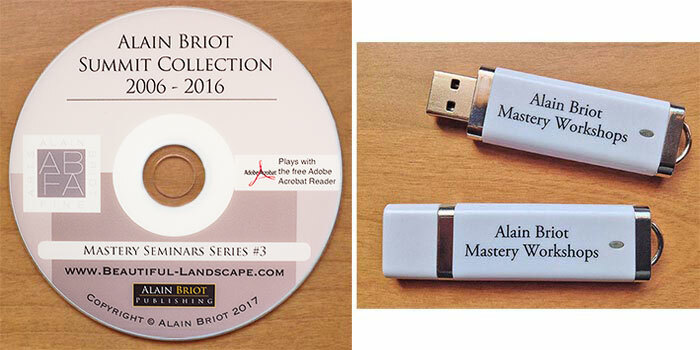 4 - You get the demonstration files used by Alain during his 2016 Summit presentations. Your Summit Collection 2006-2016 comes with a $100 off coupon good towards any of our workshops. This coupon carries no expiration date and can be used at any time. The Fine Art Photography Summit Collection, 2006-2016, features Alain's presentations for 11 Summits. If you want to attend the Summit the registration fee is $995. Multiplied by 11 this means that the total registration fee for the 11 Summit featured in the Summit Collection would come to $10,945. This is what it would cost you if you attended all 11 Summits. I decided to offer the Summit Collection at a huge discount: $1995 for all 11 Summits which represents a saving of $8950. 1 - Over 47 hours of audio recordings - The entire Summit recordings of Alain's Presentations are there. 2 - Over 60 different eBooks for a total of over 200 pages of content in eBook/pdf format. These eBooks are not available separately. 3 - Four slide shows featuring photographs taken by Summit Participants. 4 - The demonstration files used by Alain during his 2016 Summit presentations. 5 - Several Location Maps showing the locations we photographed during the Summits. 6 - Six essays not available on my other Mastery Workshops on DVD. 7 - A $100 off coupon towards registration in any of our workshops or seminars. If you do not have a DVD reader in your computer, or if you prefer USB flash cards to DVD, we can ship you the Summit Collection on a USB Flash card instead of on a DVD. If you want to take advantage of this option, simply place your order using the link above, then email us at alain@beautiful-landscape.com to let us know that you want your order delivered on a USB Flash Card rather than on DVD. The cost is the same.